Summary: Hanuman from the epic Ramayana goes by many names such as Maruti, Chiranjivi, Anjaneya, etc. He exemplifies supreme devotion to Lord Rama. He is also the most ancient super human, who is popular beyond the Indian subcontinent and mentioned in other traditions and cultures. In this essay we present the symbolic significance of this exceptional god of Hinduism..
Those who are familiar with Hinduism and the epic Ramayana know the deity, Hanuman very well. He is considered to be the greatest devotee ever born on earth. He is one of the main characters of the epic Ramayana, who played a very crucial role in the liberation of Sita and destruction of the demon king, Ravana. He was blessed by Sita, wife of Lord Rama, to remain active in the earth plane till the end of the time cycle. He has been frequently referred to in the West as the monkey god, which is incorrect because Hanuman is not just a monkey as it will be evident from the following discussion. With regard to character, strength and ability, Hanuman was far superior to even humans. His surrender to the divine cause and his devotion to Lord Rama was unique, exemplary and unconditional. Even today devotees say that wherever the name of Lord Rama is chanted or mentioned, this sacred being would be present there listening to the chanting of his name and absorbed in his thoughts. Besides the Ramayana, references to him are also found in some early texts of Hinduism, Jainism and Buddhism. According to the Hindu mythology, Hanuman was born to Kesari and Anjana Devi, with the blessings of Lord Siva. He is also known as the son of Vayu (Pavanputra), having born with the power and blessings of Vayu. Since He is Anjana's son, He also bears the name of Anjaneya. Hanuman was endowed with miraculous powers and strengths. He was the most ancient and most powerful superman known to the mankind, with the ability to expand or contract his body at will and fly across long distances, even all the way across the planets to the Sun and back. With his super human power and strength he evoked terror in the hearts of powerful demons and evil people and slew many. As a child, he said to have flown beyond the earth into the space and tried to grab the Sun with his mouth, thinking it was a fruit. The Sun god later became his teacher. Although he possessed supernatural powers, because of a curse, he would not remember them and act like a normal person until someone reminded him of his greatness and encouraged him to use his powers for a just cause. Hanuman was the chief minister of Sugreeva, the brother of Vali whom Rama killed in a rather controversial manner from behind a tree, instead of engaging him in a direct fight. Different reasons are attributed for it, but my thinking is that he did it purely for his love for Hanuman and knowing well how important their relationship was going to be once Vali was out of the way and Sugreeva, weak as he was, assumed the power. Hanuman possessed great intellect, knowledge and wisdom, qualities which Rama, the divine leader, was looking for in people when he was trying to find them and develop a strong army of warriors to confront Ravana, when the time came for a final confrontation. The epic Ramayana narrates how the first meeting between Rama and Hanuman took place. When Rama and Lakshmana were wandering in the forests of Kishkindha searching for Sita, Sugreeva and Hanuman had a chance meeting with them. At first, Sugreeva was suspicious about the strangers thinking that they might have been dispatched by his brother Vali. Hanuman assured him that they could not be friends of Vali or the spies sent by him since they were looking like respectable and dignified warriors and harmless. With Sugreeva's half-hearted permission, and to ally his doubts and fear, he approached the strangers in the guise of a brahmana and made enquires about the purpose of their visit. Rama was very much pleased when he saw Hanuman. He was impressed by his impeccable manners, his refined language, his innocence and his simple trusting heart. In the very first meeting he recognized in him the qualities of a perfect messenger (duta) whom he could trust and rely upon when the time came. Thus began a legendary relationship between an incarnation of God and a perfect devotee, which is spoken about even today as a perfect example of the highest form of devotion and true surrender. Lord Hanuman symbolically stands for pure devotion, complete surrender and absence of ego or the lower self. His character tells us what we can do in our lives by becoming pure devotees of God, aligning ourselves with the forces of good, helping the weak, with self control, unconditional faith and total surrender. As a prominent warrior of the vanara race, he symbolically represents the lower self or the animal (Neanderthal) nature in man, which when refined and transformed becomes stabilized in God and serves the divine cause in total surrender, just as it happened in case of Hanuman. As the son of Vayu, he symbolically represents the subtle bodies, namely the breath body, the mental body and the intelligence body. The breath body is responsible for the movement of life energy or prana in our bodies. It is especially strong in people who lead ethically clean and celibate lives, performing austerities, for which Anjaneya was particularly famous. As a devotee, Hanuman represents the mental body, which is made up of the thought currents that float in our chitta or consciousness. It is responsible for our imagination, astral travel and dream experiences. The intelligence body is made up of buddhi or discretionary intelligence, which is considered one of the highest tattvas or principles of Nature. Our buddhi is said to be a direct reflection of divine intelligence. It is responsible for our decision-making ability, rational thinking and conscience. As an epitome of virtue and supernatural prowess, Hanuman represents all these abilities. In this article we will examine the symbolic significance of Hanuman as the mental body representing the human mind and its various qualities and powers. The mind is fickle (like a monkey) and jumps from place to place, going after things, engaging itself in innumerable activities that disturb the peace of the place. The mind, like Hanuman can also travel where it wants to. It can fly in the air, cross the continents and the worlds in an instant with the speed of thought and reach any one and anything it wants to mentally. It can also expand or contracts itself at will (again like Hanuman). So long as it remains under the control of pure animal passions and the activities of the sense, it remains unstable and mischievous, causing much of the disturbance in the world of the individual. But once it surrenders to the inner self and becomes devoted to it completely and unconditionally, it assumes miraculous powers and performs stupendous feats like Hanuman, working for the divine cause helping the lower self (Sita) and the Soul (Rama) to come together and become united. By killing all the evil thoughts with its determination, it also lays a firm foundation for the kingdom of God (Ramarajya) to become established in the body. Hanuman is thus symbolically the mind principle ever absorbed in the contemplation of God and totally surrendered to Him. However, this is not the only interpretation available for Hanuman. 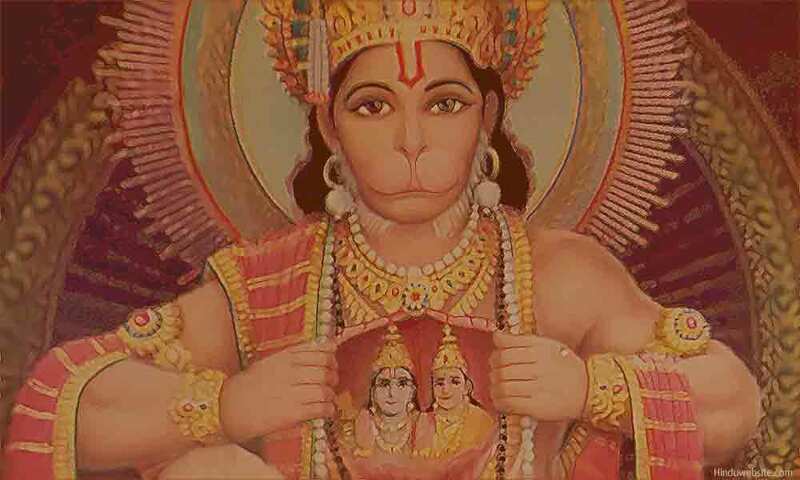 As "Hanuman," he is the one without any doubt (anuman) as to the existence of Rama (God). As anjaniputra, he is the one who comes accidentally into this world, but by his efforts ascends to the greater heights of spiritual evolution. As Vayuputra he is the breath body in us and can help the lower self (Sita) that is lost to ignorance to reunite with its true companion, the inner soul (Rama). As Veeranjaneya, he is the source of courage and confidence for many a timid heart. As Bhajarangbali, he is strong in both devotion and physical strength. He is an ocean of virtues and friend of the pure hearted. He loves the ascetic qualities in man because only those who are detached and mentally free from the luxuries of life and desires of their bodies can truly concentrate on the divine and attain Him. In the macrocosm Rama represents the Supreme Self and Hanuman as his devotee, the individual Self. Within in the microcosm of the embodied Self (jiva), Rama represents the embodied Self, who is caught in the cycle of births and deaths (Samsara). Sita represents the physical Self or mind and the body complex (Kshetra). Ravana with his ten heads represents the ego with ten senses which have fallen into evil ways. Hanuman represents, the breath. When ego and the senses carry away the mind and body and put them to wrong use, with the help of breath the embodied soul restrains the senses, silences the ego, regains the control of the mind and body and stabilizes them in the contemplation of God. Thus, Hanuman represents many things at many levels. He is regarded as the Superman, the perfect man, the knowledge body (gnana guna sagara) in man, the immortal man (chiranjeevi), the animal man and the flying human (va+nara). He is a perfect example of true devotion and complete surrender. He also symbolizes the story of animal man in us who through the path of devotion and service to God, can purify himself and attain immortality. Truly in the entire Hindu pantheon there in none like Shri Hanuman, for he was an evolved God, born strangely as a manifestation of Lord Shiva but became a great devotee of Shri Mahavishnu through Lord Rama.